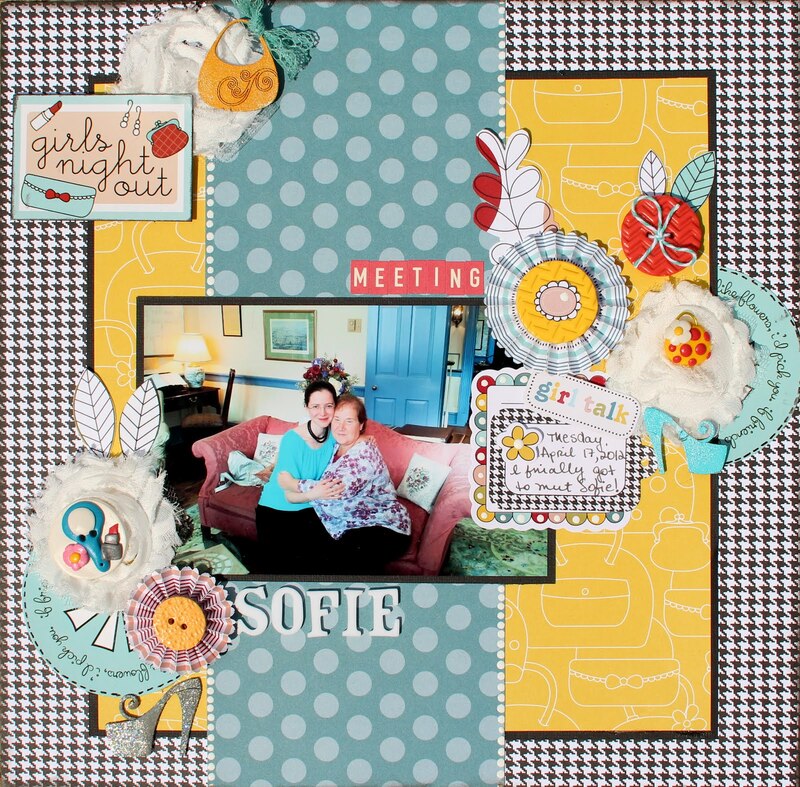 What a bunch of scrap...: Blog Hop! Hi everyone, welcome to my stop on the Imaginisce and My Little Bit of Whimsy (MLBOW) blog hop! As part of the Imaginisce DT< I was lucky enough to get a package of really adorable hand-sculpted buttons and stick pins from MLBOW. I created two layouts to show off some of my cute new embellies. 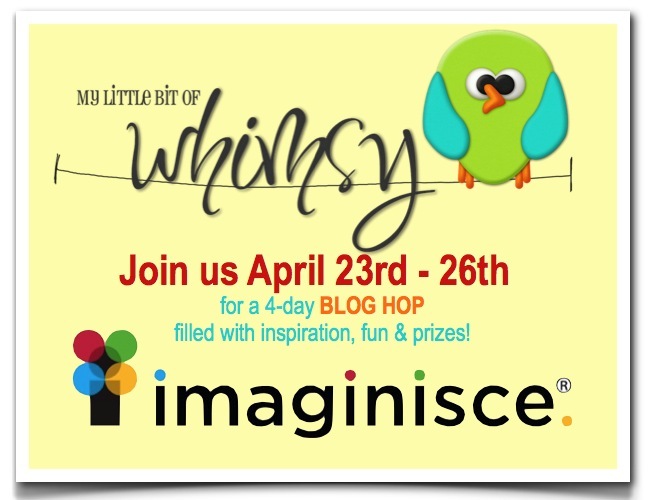 First up, I have a layout using the Hippity Hop and Makin' Waves collections from Imaginisce. I kept it on the clean and simple side (or as clean and simple as it possibly ever gets for me :) I really wanted to keep all embellies to a minimum to show off the super cute MLBOW goodies - I used a polka-dot button, cute mushroom and ladybug, and the flower-shaped yellow button. I also used lots of die-cuts from the Hippity Hop collection - I so love that line! For my second layout, I just had to use the "Sole Sisters" collection from Imaginisce to scrap this picture I got of meeting Sofie. Sofie is the owner of Scrapmatts (and she lives in Australia), but she was vising USA, and I finally got to meet her (after a year and a half of being on her DT!). I used lots of various buttons from MBOW, as well as a purse stick pin. It went perfectly with this collection. I also used some Scrapmatts laser-cut chipboard high heels and a purse. One of the high heels I heat embossed with Cotton Candy WOW Embossing powder from the Suzy West collection, and the other one I inked, and then hear embossed with clear glitter embossing powder, also from WOW. The purse, I heat embossed with Honey Earthtone Suzy West Collection powder. So your next (and final) stop is the MLBOW Blog! What great layouts - really fun buttons too. These layouts are great! My favorite is the kite one! Love how you used the papers and embellishments! This is my first exposure to MLBOW, I love all of the little bits and buttons! Your LO is just adorable. Wonderful layouts. Beautiful papers and sweet & fun embellies. Thanks for sharing. Wow! Beautiful LO!! Love the bright colors!! I love all of these layouts Ilene! Wonderful job with the Whimsies and I-rock products! I love your layouts! The stick pins and buttons from MLBOW are just super cute and work so well with the Imaginisce paper collections! I am in love with the sole sisters collection and that is at the top of my wish list at the moment! Just need to find an excuse for hubbie to let me get some!! :-) Thank you so much for the inspiration - just became a follower. I love your scrapbook pages. Great Layouts!! I love the look of the kite flying one. Fabulous [ages!! I especially LOVE the kite one!! Awesome layouts! I love both of them! You did a great job! Wow, you scrapped Sofie already. Fabulous page. Great layouts with these products! What a precious layout. Thanks for sharing! Beautiful layouts. I love how even everything is placed. Love the paper too....so bright and fun. Gorgeous LO! Love the colors you chose and those Whimsies are simply "whimsy"!!! ;-) TFS! These are gorgeous layouts Ilene! Beautiful layouts! I just love that little ladybug you used! Another Some Odd Girl Card!